Ritz turtles – caramel and pecans atop a Ritz cracker and smothered in chocolate. 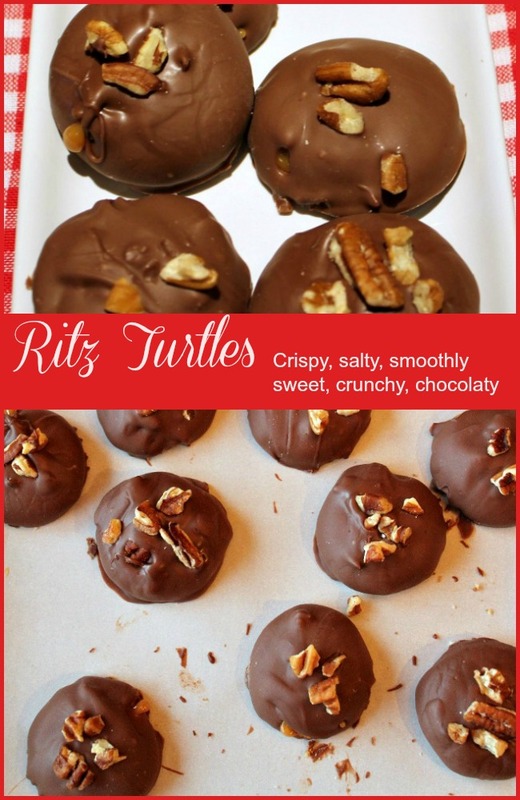 Crispy, salty, smooth sweetness with the crunch of pecans – all covered in chocolate deliciousness. These yummy bites are so easy to make you won’t believe it. You will want to double this recipe. Don’t. Make two, or even three or four, batches. By the time you get to the last cracker, the caramel is beginning to set up in the bowl. So repeat the recipe instead of doubling it. Because you will want more. For the same reason, divide the chocolate and only melt half of it at one time. The chocolate begins to set up by the time you get to the 16th or 17th cracker. Use a candy chocolate like almond bark or candiquik for best results. I don’t know how long you can store them in the refrigerator, to be honest. None have lasted past the second day around here so storage is not even on the radar. 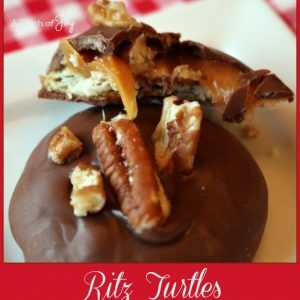 caramel and pecans atop a Ritz cracker and smothered in chocolate. Place caramels and whipping cream in a microwave safe bowl. Microwave for 30 seconds and stir. Microwave an additional 15 seconds and stir. Caramel mixture should be smooth. if necessary repeat until caramels are smooth. Let cool a few minutes. Place parchment or waxed paper on a baking sheet and lay out 30 Ritz crackers. Scoop about 1 teaspoon of the caramel mixture in the center of each Ritz cracker, carefully spreading with the back of the spoon to cover the cracker. Leave slightly mounded in the center. Top warm caramel with pecan pieces. Melt 3 half almond bark in the microwave, according to package directions. Dip the cracker and caramel in the chocolate and spoon chocolate to cover. Lift cracker with a fork, scraping off excess from the bottom. Place chocolate-covered cracker and caramel back on the parchment or wax paper. Sprinkle the top with a few additional chopped pecans while the chocolate is still warm. I love these simple ideas at Christmas. Everyone appreciates homemade goodies and these will be awesome. I love the salty/sweet. I’m giving your recipe to everyone who I give these to. They claim not to bake, but these don’t bake! I think they prefer I do the baking and share.